We meet every Wednesday afternoon, unless we decide otherwise, 2.30 to 4.00pm in the Leader's Home. We close down for the summer between May and September. 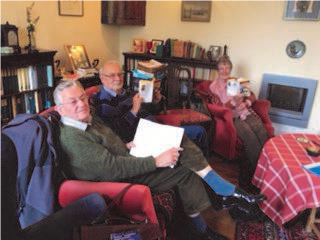 Members order their own book copies via Internet. There are usually 8-12 members present. We agree on how many pages to read before the next meeting, then discuss them and read on a little way, which usually leads to further discussions - in French, but we’re not averse to dropping into English if we can’t find the words! We have been reading Les voyages de sable by Jean-Paul Delfino (2018), the picaresque adventures of a man who is apparently immortal, followed by Une pièce montée by Blandine Le Callet (2006), a merciless depiction of a traditional French middle-class wedding, seen through the eyes of various participants. We appreciate any book that enlarges our picture of the French experience, especially while we are sitting around the fire in cosy armchairs.